As volunteers we’re not expected to be experts; we’re people who are passionate about the site and enjoy working on the garden areas, pond and other site maintenance, checking that the site is in order and helping visitors. Most volunteers come along with no experience at all and learn as they go. 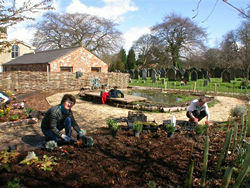 Some volunteers put their specialist skills in tree work or their particular gardening knowledge into practice. 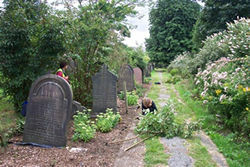 Volunteer Weekend Wardens help to look after the site at weekends and bank holidays, when the Cemetery Warden and staff are unavailable. They walk around the site providing help and guidance for visitors and checking that everything is in order. Some people like to work in pairs or bring a friend. Training and equipment is provided. Other volunteering opportunities such as helping with walks, events and funerals are also available on an ad hoc basis. It’s not just about work! Throughout the year, there are social and educational visits for the volunteers, including visits to places of interest such as local nature reserves and cemeteries, pub socials and the Christmas party.